Rampmaster’s light-weight Aluminum Mobile Yardramp permits the loading and unloading of trailers and railcars, with a propane operated fork lift, in areas where normal docking facilities are not available. The yardramp can be easily moved on either 6 pneumatic or 6 solid cushion tires. Yardramp capacities range from 11,000 to 24,000 lbs; the standard operating width is 63″ or 74″. A railcar platform is recommended for use with railcars. Please watch our videos for additional information. Understructure consists of a rigid double channel box section aluminum frame carrying six wheels and is hydraulically lifted. 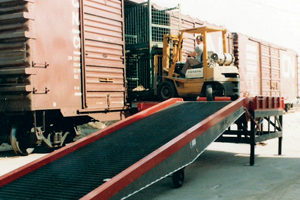 A 30ft Mobile Yardramp is attached to a 10ft x 10ft steel platform making unloading of the railcar easier. The platform is also manufactured by Rampmaster and is a quoted item. HYDRAULIC HAND PUMP – Used to raise the front end of the ramp from 38″ to 61″. The pump is on the side behind a hinged door, with a pocket for storing the handle, and an easily accessible release valve. 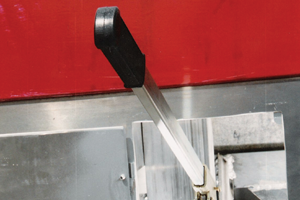 SWIVEL HEAD TOWING CLAMP – For moving the ramp by inserting a fork lift blade. ROUNDED CURBS – To save wear on fork lift tires. SERRATED OPEN GRATING – For positive traction in all weather. ALUMINUM TREAD PLATE LEAD ON SECTION – The lead on section is 3 feet long and either 63″ or 74″ wide depending on model and is constructed of 1/2 ” 6061 T-6 aluminum. 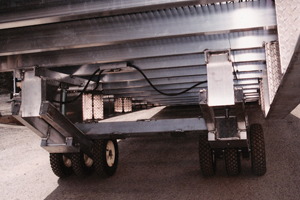 TWO 8′ SAFETY CHAINS – One on either side of the top end, to secure the ramp to the vehicle or dock while in use. PNEUMATIC OR SOLID CUSHION TIRES – Each yardramp has either 6 pneumatic or 4 sold cushion tires.